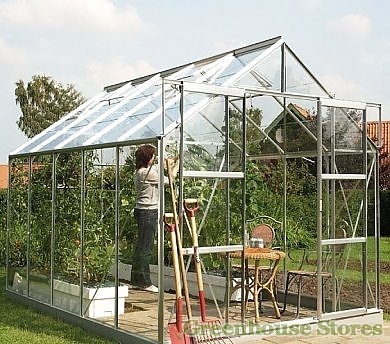 2570mm (8ft 5") Wide Aluminium Greenhouse - Practical width for serious growing. 3mm Horticultural Glazing - Great Light Transmission . 2 Opening Roof Vents - For good ventilation. 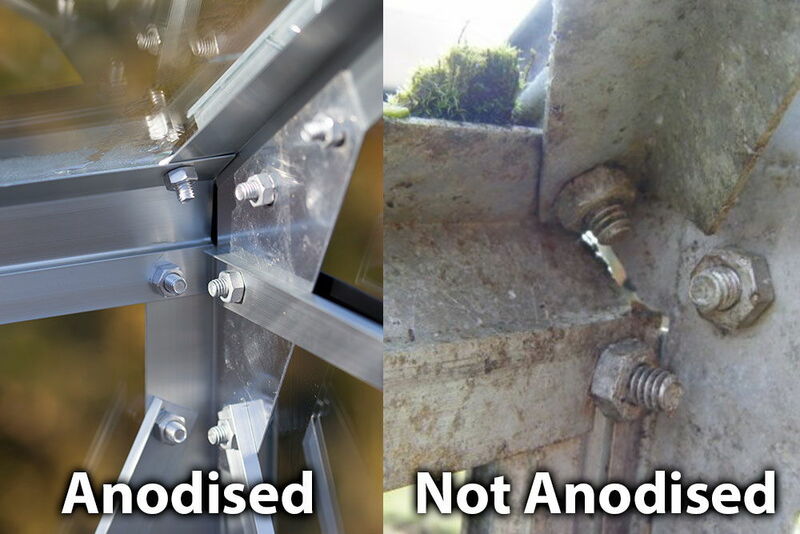 Anodised Aluminum Frame - No rust or discolourisation! Double Sliding Doors with latch - Wide Access for wheelbarrows. High Eaves (1510mm) - Ideal for Tomato and Vine Plant Growing. Integrated Gutters - Collect all that lovely rain water for your plants. Extra Bracing and Corner Plates - For strength in roof and corners. 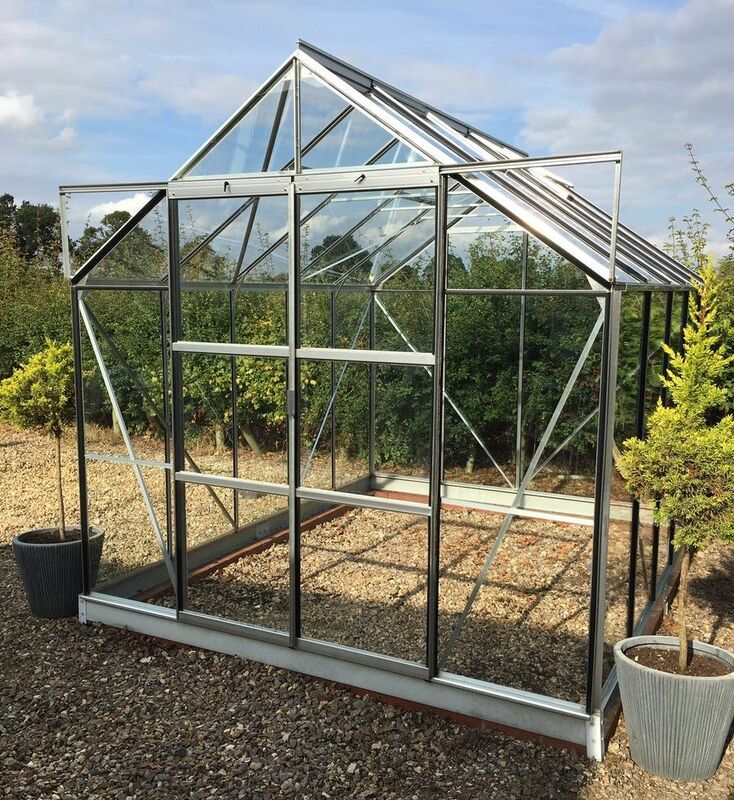 The 8x8 Silver Vitavia Jupiter 6700 Greenhouse has high eaves and a great practical growing area with easy access through it’s double doors. The Jupiter Greenhouse is a greenhouse for serious growers. Being 8ft wide with double doors means plenty of space for plants of all kinds and easy access for equipment and wheelchair users. The Jupiter has nice high eaves at 4ft 11" that gives great working space and makes growing tomatoes and climbing plants a lot easier. This Vitavia Jupiter 8x8 has 2 opening roof vents for ventilation, a smooth sliding double door and integral gutters. This 1 Tier Vitavia silver greenhouse staging gives you a handy work surface and storage area. 1.2m(H) x 0.5m(D) x 0.75m(W). This 2 Tier Vitavia silver greenhouse staging gives you a handy work surface with additional low level storage. 1.2m(H) x 0.5m(D) x 0.75m(W). An extra roof vent for Vitavia Greenhouses. Includes glass. Curtain shading will protect your plants from sun scorch and provide shade to moderate temperature. 6ft x 8ft 6"
Collect the rainwater from the gutters in your greenhouse. Rainwater is the best water for your plants. The Fastfit 8x8 Greenhouse Floor Kit is the most cost effective and simple way of providing a level floor for your Greenhouse. The 8x8 Greenhouse Floor Kit comes with a simple to construct click together system complete with water permeable membrane to provide essential drainage for your greenhouse whilst keeping the weeds at bay. Quick and easy preparation means no waiting times for concrete to dry.